For fans of White Oleander and The Brief Wondrous Life of Oscar Wao, an exquisitely rendered debut about a wise-beyond-her-years foster child searching for a home, entwined with the heartbreaking story of the mother who abandoned her. Marjorie Celona received her MFA from the Iowa Writers’ Workshop, where she was an Iowa Arts Fellow and recipient of the John C. Schupes fellowship. Her stories have appeared in Best American Nonrequired Reading, Glimmer Train, and Harvard Review. Born and raised on Vancouver Island, she lives in Cincinnati. "[A] heartfelt first novel . . . . Ms. Celona adroitly confounds many of our expectations . . . . It's refreshing to read a novel in which questions are not so much answered as extended, and Shannon is an appealing narrator... Celona is compassionate toward even her most wayward characters, figuring wisely that the consequences of their actions will be punishment enough." 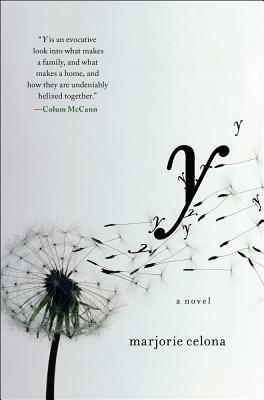 "Y is a beautiful, moving book that explores what it takes to belong from a new author with a voice that is bold, sure footed and confident." "[A] stunning debut novel . . . Celona creates a beautifully tangled web that is equal parts mystery (seriously, this one's a page-turner), poetry and deep rumination on the meaning of family." "As a newborn, Shannon is abandoned at the local “Y”—and then spends much of her young life asking “Why?” The cards seem stacked against Shannon as she tries to piece together the fragments of her life. Celona reconstructs the story with an almost Faulkner-ian complexity [and] writes movingly about basic questions of identity."